What is Linseed? It is a rich source of Omega 3 fatty acids (ALA), containing twice as much as fish oil. As it is plant-based, it is perfect for vegetarians and vegans, but it benefits everyone. It is also a good source of Omega 6, Omega 9 and vitamin E. It also contains lignans, which are a class of phytoestrogens considered to have anti-oxidant properties. What is the difference between linseed and flax seed? Linseed and flax seed are often confused. Flax is grown as a fibre plant that is used for linen. Linseed is grown for its seed to make oil. The flax plant is taller than linseed and is pulled by hand or nowadays by machine. 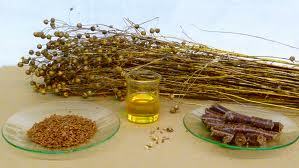 When you see food products called flax seed or flax seed oil it will almost certainly be linseed or linseed oil. The linseed plant is shorter and generally has a bigger seed with more oil. The Latin name for linseed linum usitatissimum means most useful, and it has been used in all its forms for many thousands of years. We are often asked about the taste of linseed for those who haven't tried it before. The good news is that fresh linseed oil tastes great, our linseed pods and culinary oil have a smooth and slightly nutty taste. "My linseed oil arrived this morning, I only rang you yesterday afternoon! Many thanks for your GREAT customer service, and also your wonderful products. My oil was just pressed a couple of days ago, you can't get better than that! Many thanks again. Kind regards."